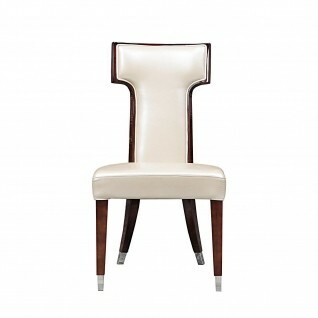 Marvin modern dining armchair is features leatherette gray upholstery and brushed stainless steel frame. Marvin chair has wooden detail matching the upholstery color on the arms and a compact design which makes it perfect for small dining table set ups or an office waiting chair. Marvin modern dining armchair is features leatherette black upholstery and brushed stainless steel frame. Marvin chair has wooden detail matching the upholstery color on the arms and a compact design which makes it perfect for small dining table set ups or an office waiting chair. Stanley modern dining chair has a modern unique silver brushed stainless steel base with accent details and gray faux leather upholstery. Available in Gray, Beige and White colors.